first Lemmy Kilmister of Motorhead, and yesterday, David Bowie. and both of them had relationships with black women. that struck a cord with me. through television, radio and later, the internet. The main tv station i learned from was vh1, where they had documentaries and music countdowns focusing on different artists and eras, which is where i first learned of two people. The first rock and metal genres i got into were goth, glam and thrash. Metallica was the first big metal band i got into as a tween, thanks to my local radio station WEBN playing a block of them at 10pm every night called "Mandatory Metallica." and then the fascination with Lemmy Kilmister began. 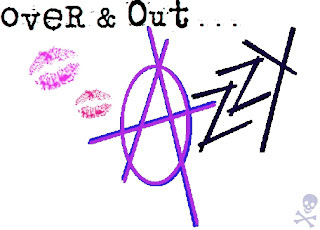 I knew about 80's glam, which led me back to punk and 70's glam. I learned the connections between Motorhead and punk, then later learned some connections between punk and 70's glam when Joan Jett led me to The Stooges, and Iggy Pop of The Stooges led me to David Bowie. I was watching one of the many music shows on Vh1 when Bowie was on Tv, then my mother came into the room and started talking about him to me during the commercial. She also mentioned Iggy Pop and also Freddy Mercury of Queen during her monologue, and near the end she said "Did you knew he's married to Iman? They look perfect together." and i almost couldn't believe my ears. People may think that it's outdated to think that interracial relationships are difficult, but they are even now. I didn't see very many growing up, especially not where the woman is black, like my family. My dad is Puerto Rican and my mom is African-American, while the few mixed kids i met as a child had white moms. Months before the conversation about David Bowie and Iman, I had a boyfriend who couldn't tell his mother about us because i was black. Although he was a great guy and later a good friend, it wasn't the reason we broke up, but i never forgot it. I tried to be rational about it, that maybe he did that to respect his parents because i never had to be hidden from anyone else...but on the inside, it made me feel like something was wrong with me. And that wasn't the only time it happened. There was a guy at school i really liked, i think everyone knew that. I never outright told him, but it was common knowledge at that point. I thought he was so cool, we liked all of the same things, had the same humor, he was smart, he was always nice to me. Then i was told by a mutual friend that he said he'd never date me because i was black. As much as i liked him, and i wasn't interested in asking him out at the time, it still broke my heart a little bit. My sister, who is 4 years younger than me, even her first real boyfriend couldn't tell one of his parents that he was dating her. She dealt with being a secret for at least two years. even right now, i've been dating the same person for almost 7 years, and i don't go to his house anymore because his dad said something racist and i couldn't be comfortable there anymore. there are a couple of other instances, but i think you get the point. Being not just a girl, but also biracial and black in the rock and metal scene felt a little lonely. Only in recent years have i actually been finding people who are into what i am that (i say loosely) look like me, I used to be the little brown dot in the crowd at concerts, and now i'm seeing a few more brown dots...but it still feels awkward and a little lonely, no matter how nice everyone is. I know that sounds naive, but not everyone wants to be the exception to the rule, you know? Its not necessarily that i was "into musicians," just some of the guys i liked happened to be musicians. I've always been passionate about the music i like, and that passion has only grown with time. As i started to become interested in boys, it became awkward for me and i felt down. I felt like i would always have to tip-toe around anyone i found appealing, and that if they did like me, i'd have to be a secret, and that's just how it had to be. 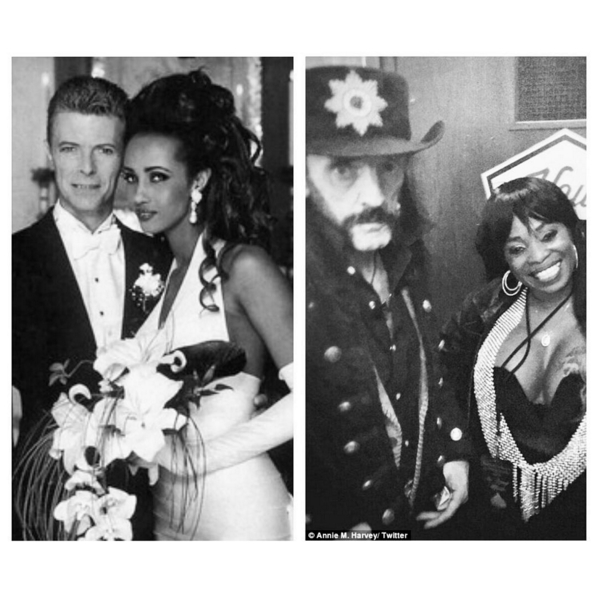 Learning of David Bowie and Iman, and later Lemmy and his girlfriend Cheryl, kind of opened my eyes...these weren't just men, or just rockers or just musicians, these were icons. These two men were the idols of my idols, they influenced practically everything i love about rock and metal and inspired generations of musicians. Two men, considered Gods in the music world, and they didn't hide their relationships with black women. Hell, Lemmy wrote the Motorhead song "In The Black" about Cheryl! Some people may not understand this kind of impact, because i guess you just have to go through it to get it...but those seemingly small pieces of information helped change my perception of myself. I thought for a long time that there was something wrong with me, but i was wrong. Something was wrong with them. It wasn't that i wasn't good enough for those guys i liked before, they were the ones who weren't good enough for me. If black women were good enough for rock Gods like Bowie and Lemmy, then my standards were clearly way too low, that's the way i see it...and i refuse to see it any other way! Thank you, David Bowie for being the avant-guard inspiration for everything that was and currently is glamorous, artistic, androgynous and out of this world. Thank you, Lemmy Kilmister, for fusing punk and metal, being the epitome of everything that is rock n' roll and bringing the bass in a way that no one else could. Thank you both for spreading your dedication, knowledge and creativity across the world and for letting us live vicariously through your for all of the years you could. and thank you for showing me that i didn't deserve to be anyone's secret.